I am an avid reader of Khmerization and KI Media but have noticed that our stories are rarely printed. You can find free PDFs of some of our stories at etmcambodia.com. The stories that are free to download can be reproduced online, although the stories we charge for, and the other stories in the magazine, cannot be redistributed, even if they are paid for. Redistribution of any stories not provided for free on our website would be a breach of international copyright and is thus prohibited. Anyway, as I said before you may post the free stories if you wish. This issue, we are giving away one story about consumer standards that you might find interesting, as well as a cultural feature we worked on with the Reyum Institute. Please feel free to call me with any queries regarding our free story/distribution policy. Keep up the good work! Thanks your interests in our works. Thanks also for letting us know about your website and your free offer to us to use your works. We would be very happy to use your works if we had known about the existence of your works and your free offer. Please be informed that I have just listed your website in the link at Khmerization. Opposition leader Sam Rainsy refers to the effects of the global economic crisis on Cambodian workers' conditions. He tells workers about the US$500-million stimulus package he has suggested in order to save jobs and create new ones. Such a plan requires a reduction in corruption and more emphasis on serving the public interest. Sam Rainsy rejects Prime Minister Hun Sen's plan to send workers back to the countryside. - Caller: CPP agent named LAY Channareth, a former commune councilor for Sihanoukville's Sangkat Lek Boun commune. - Receiver: SRP official SENG Sophorn, a current commune councilor for Sihanoukville's Sangkat Lek Boun commune. "When I was in high school, I initially wanted to be a doctor, but when I decided to focus on studying finance, I looked at several different universities. My family thought studying in Phnom Penh would be too far away, so I decided to study here and have been very happy with my decision. Studying at USEA was a good decision for me." The University of South-East Asia (USEA) has grown rapidly since opening in 2006 to become one of Siem Reap's largest universities. The university campus, opposite Angkor High School, teems with state-of-the-art technology inside the classrooms and has sleek modern finishes outside. The private university has 49 lecturers and three faculties: arts, humanities and languages; science and technology and economics; business and tourism. USEA has more than 800 students enrolled for the 2008-09 academic year, including 70 studying for their master's, a program on the agenda for the first time this year. In 2007 USEA achieved top honours from the Accreditation Committee of Cambodia. Rector Sien Sovanna has been in charge of USEA since 2007. He is the owner of Siem Reap's booming language school chain, Future Bright Institute, and said the university's all-encompassing name aimed to make it famous within the region and internationally. Vice Rector Rous Bunthy is one of the university's inaugural directors. Rous Bunthy, a Phnom Penh native, said the campus gave Siem Reap people a quality alternative to studying in the Kingdom's capital. "The perception has changed more and more. People have recognised they can study in a quality learning environment right here without going to Phnom Penh," he said. "Our aim is to provide education and training to the highest quality to meet national and international labour market needs." Students must have a high school diploma and take a placement test in English to be accepted to an associate's or bachelor's degree program. The two-year associate's degree covers 20 subjects, while the bachelor's degree covers up to 44 subjects over four years depending on the faculty. An associate's degree costs $340 per year and a bachelor's degree costs $360 per year, but fees for studying English or information technology are slightly higher. USEA offers students three graded scholarships. An A-grade scholarship covers all tuition fees for the duration of a Bachelor degree, a B-grade scholarship covers 50 percent and a C-grade scholarship 30 percent. USEA has an international student exchange program with Dhurakij University in Bangkok, Thailand. The university has an incentive system for students who have a perfect attendance sheet for lectures. The modern buildings at USEA are fitted with state-of-the-art learning resources, courtesy of the US Embassy and the World Bank. There are two computer rooms in the five-storey classroom complex and a cafeteria. The resource centre has an employment office, and provides counselling services and studying strategies to help before semester exams. USEA Vice-Rector Rous Bunthy hinted there were plans afoot to introduce new faculties accommodating agriculture, law and political science some time in the near future. Phoum Wat Bo, Khom Salakomroek, Srok Siem Reap, Siem Reap, Cambodia. KHMER Rouge prison chief Kaing Guek Eav (pictured) told Cambodia's war crimes court Wednesday that two of the Westerners imprisoned at the S-21 security centre had been interrogated on his orders. "For the Cambodian cadre, we were instructed by the superiors who was special and who was not. But for the foreigners, I made that decision. I assigned [deputy of interrogations] Comrade Pon to interrogate them," the former jailer, known as Duch, told the court in response to questions from civil party lawyer Hong Kim Suon. "There was one American, a British, a New Zealander and an Australian," he said, adding that Comrade Pon had interrogated "a New Zealander and maybe a British guy". He told the court that Western prisoners at Tuol Sleng were kept in a "special prison" away from their Cambodian and Vietnamese counterparts until "the second quarter of 1978". Duch on Wednesday also denied using the technique known as waterboarding as a torture method, telling the court he preferred more simple methods of interrogation. "The first items to be used for torture were whips and electrical wire from a phone cord," he said. He said waterboarding involving "a scarf and water" was "another technique learned from the Lon Nol police". But Duch said he questioned the use of techniques that could potentially kill victims and cause confessions to be lost. Meetings between Thai and Cambodian defence ministers yield some agreements but do not solve border standoff at Preah Vihear temple. Minister of Defence Tea Banh (front right) shakes hands with counterpart Prawit Wongsuwon in Siem Reap on Wednesday. THE sixth annual set of talks between Thai and Cambodian defence ministers ended midday Wednesday in Siem Reap, with agreement on some issues including demarcating their shared border, but no breakthrough on the crucial issue of troop withdrawals from around the contested Preah Vihear temple. Cambodian Defence Minister Tea Banh and his Thai counterpart Prawit Wongsuwan hailed progress made during the meeting, citing agreements to use the Joint Border Commission to find border markers and continue demarcating the neighbouring countries' shared frontier and a decision to resolve overlapping claims in the Gulf of Thailand through existing mechanisms. "The two sides confirmed that the border issue should be resolved based on the [Memorandum of Understanding] on measuring and demarcating made on June 14, 2000," said a joint statement issued on Wednesday after the meeting, referring to a breakthrough agreement eight years ago. But solving the standoff around the 11th-century temple will take more time, Tea Banh said. At least seven Thai and Cambodian troops have been killed in recent months in sporadic clashes between the neighbouring countries on disputed land around Preah Vihear temple. "The issue of troop pullback ... from the area near Preah Vihear temple depends on the negotiation related to border demarcation that has not been agreed to yet," Prawit told reporters in a joint press conference, adding that he himself was struggling to get up to speed on the issue, having only been defence minister for about four months. Troop withdrawals will have to wait until demarcation has been completed to both countries' satisfaction, he added. 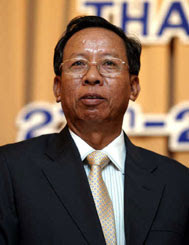 Tea Banh said that both countries were using all means possible to resolve the border dispute. Troops from the two countries have been in a border standoff since tensions flared last July, when the temple was awarded United Nations World Heritage status. Ownership of the temple was awarded to Cambodia in 1962, but the two countries are in dispute over 5 square kilometres of land around it that have yet to be demarcated. PHNOM PENH, Cambodia (CNN) -- Norng Chan Phal ran through the notorious Khmer Rouge prison S-21 in the Cambodian capital as a 9-year-old boy, frantically looking for his mother after their torturers had fled from advancing Vietnamese troops in 1979. Norng Chan Phal was one of five children who survived the S-21 prison. He didn't find his mother, but what he did see made him hide under a pile of clothes with other children for days in the prison. "I was shocked when I saw the bodies -- I was thinking maybe my mother was killed like this as well and I ran back to hide with the other kids," he told CNN. Norng Chan Phal is one of a few people to survive the school converted into a grisly prison, where more than 14,000 perished at the hands of the ultra-Maoists bent on creating an agrarian utopia -- an experiment that failed and left at least 1.7 million people -- or nearly a quarter of Cambodia's population -- dead from execution, disease, starvation and overwork, according to the Documentation Center of Cambodia. He is one of many survivors of the Khmer Rouge still seeking justice more than 30 years after the Vietnamese toppled the genocidal regime. But whether that happens remains to be seen. A war crimes tribunal backed by the United Nations got under way earlier this year after more than a decade of preparation, with five of the regime's former leaders facing charges that include crimes against humanity. "The scale of the atrocities is indeed mind-boggling ... all of these crimes are to me crimes against humanity and put a tear into the fabric of humanity and have to be repaired and have to be fixed," said Robert Petit, chief co-prosecutor. In "Killing Fields: Long Road to Justice," CNN's Dan Rivers examines Cambodia and the nation's attempt to confront its past with a U.N.-backed war crimes tribunal. First in the dock was Kaing Guek Eav, also known as Comrade Duch, a former mathematics teacher turned born-again Christian who is accused of overseeing S-21. "I am responsible for the crimes committed at S-21," he told the court. "I would like to express my regretfulness and my heartfelt sorrow and loss for all the crimes committed from 1975 to 1979." Of the five charged, Comrade Duch is the only one of the group who admitted his responsibility at S-21. The other four charged had lived in freedom up until late 2007 and they have been denying their responsibility. Many others connected with the regime and alleged atrocities are still at large. Thousands of documented confessions found in the prison archives show he was the man who made prisoners talk by using means such as electrocution, waterboarding, merciless beatings and mutilations. Ta Chan has not been charged with any crimes by the tribunal, and refused to speak with CNN, though his son said his father was old and his health was bad, and none of the family wanted to talk about the past. But CNN found a woman who said she was a former comrade of Ta Chan -- and that she was still afraid of him all these years later. "Ta Chan used several methods of torture," Mom Va said. "He pulled prisoner's fingernails out with pliers and strung prisoners up and smashed them into brick walls." Some critics question whether the tribunal will provide a final closure to many Cambodians who continue to live in fear of -- and anger at -- the Khmer Rouge. Their concerns have grown with allegations by some tribunal staff members alleging they have been forced to hand over part of their salaries to an official. There is no suggestion the judges or lawyers are involved, instead it is Cambodian staff from the court's Office of Administration who are at the center of the allegations. CNN interviewed two Office of Administration employees who described pressure on employees to kick-back money to their boss. "We have received, indeed, a couple of anonymous complaints but none of them have referred to the matter you have raised," Helen Jarvis, a court spokeswoman, told CNN. The Cambodian government told CNN a senior Cambodian court official was investigated for corruption but was exonerated. "They told me they cannot find any proof of kick-back or corruption," said Khieu Kanharith, government information minister. "If you want the court -- the trial -- to go ahead, separate the two cases." But some involved in the tribunal have speculated that the U.N. may have to pull out of the process if this issue isn't tackled, meaning the trial could collapse. "It's becoming a real possibility and it would be a massive shame for the Cambodian people. The victims who've been waiting for 30 years for these trials they deserve justice, they deserve peace, they deserve closure," said Richard Rogers, Chief of Defence Section of Trial. On many days, Cambodians fill the court outside of Phnom Penh to watch the proceedings. Despite the skepticism and concerns of some, Norng Chan Phal is hopeful of the outcome. "I think (the) Khmer Rouge court is very good for people like me and other victims. We believe the court can find justice for us." (CNN) -- In Killing Fields: Long Road to Justice," CNN sheds new light on atrocities committed in Cambodia during the Khmer Rouge regime of 1975-1979. 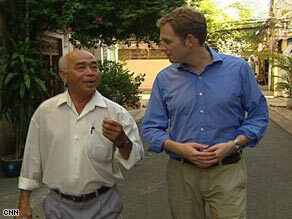 Vietnamese ex-television cameraman Ho Van Tay talks to CNN's Dan Rivers. In a groundbreaking new documentary CNN's Dan Rivers goes on the hunt for Ta Chan, the chief interrogator of the Khmer Rouge's notorious S-21 prison camp. For the program, CNN obtained exclusive and previously unseen footage of Ta Chan giving a tour of another Khmer Rouge jungle prison. CNN's Rivers also details corruption allegations at the Phnom Penh trial of Khmer Rouge leaders, reporting on prosecution and defense fears that the trial will be tainted by the allegations. As S-21 commandant Comrade Duch and four Khmer Rouge colleagues currently face justice in the UN-backed trial, Ta Chan continues to live in a remote Cambodian village. While he has not been charged with any crime, survivors say Ta Chan played a key role at S21. Rivers speaks with Chan's family as the alleged former torture chief hides from cameras. In exclusive footage from 1996, uncovered by the program's editorial team, Ta Chan gives a guided tour of what he said at the time was a recently closed Khmer Rouge prison in the jungle. The documentary chronicles in painful detail how torture was part of S-21's daily regime, resulting in up to 14,000 deaths. The program also features rarely seen footage from 1998 of the last known TV interview with ailing Khmer Rouge leader Pol Pot, who led the country into the horrors of genocide. 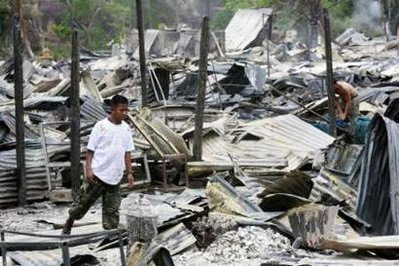 The ashes of the Phsar Krom Market burnt by Thai shelling. A serious clash between Thai and Cambodian soldiers near the Preah Vihear temple on the northern Cambodian border in early April resulted in the Thai Army shelling and destroying a civilian market and homes adjacent to the temple. No civilians were hurt in the shelling but a Cambodian NGO has filed a 9 million US dollar claim against the Thai government on behalf of the 900 affected villagers. And a human rights NGO says Thailand's shelling of the market was a breach of the Geneva Conventions. CARMICHAEL: The 900-year-old temple of Preah Vihear on the northern border of Cambodia is one of the country's most treasured possessions. Preah Vihear is also contentious - Thailand lost an international court case over ownership of the temple back in 1962. But demarcation of the 800-kilometre long border between the two nations still hasn't been agreed - and that includes the area around the Preah Vihear temple, which sits squarely on the contested border. Over the past year tensions have risen and subsided as troops from both countries faced off there. In early April fighting broke out at Preah Vihear, and several Thai soldiers were killed and injured - the precise number isn't clear. But what is clear is that three rockets - seemingly fired by the Thai army - hit the local market where 260 families lived. The market and their homes were completely destroyed. The temple also suffered some damage. Moeung Sonn runs a local NGO called the Khmer Civilization Foundation. On behalf of the villagers, Moeung Sonn sent a compensation claim to the Thai government for nine million US dollars. He hasn't yet had a response from Bangkok. Photographs on the wall of Moeung Sonn's office in Phnom Penh show the remains of the market - there isn't much, just a wreckage of scorched corrugated iron. SONN: This area is protected by UNESCO. SONN: Yes, World Heritage. So no reason Thais destroy this area. CARMICHAEL: Moeung Sonn says the traders at the market had spent substantial sums building up their stocks ahead of the Cambodian New Year in mid-April when many Cambodians visit the temple. But before they could come, the market was shelled and the traders lost everything. Thus the claim. So does Moeung Sonn think the villagers will get compensation from the Thai government? SONN: I think the Thais will pay. I think the Cambodian government don't drop this matter because these rockets came from Thailand. And so no reason why [Thailand] don't pay to Cambodian villagers. CARMICHAEL: But compensation is only one aspect of the shelling. British lawyer Rupert Abbott is a director at the Cambodian Centre for Human Rights, a local NGO. Later this week his organisation will release a report on the incident and the applicability of international law to what happened. Mr Abbott's report indicates that the Thai army's action did break international law. ABBOTT: We do believe based on our investigations that Thailand has breached international humanitarian law. It's breached the Geneva Conventions. There were no soldiers in the village, it wasn't being used for military use - there were no weapons, no hardware, playing no military role. And it seemed that it was deliberately attacked. The three rockets fired all hit the market. It was then sprayed with machinegun fire when the civilians tried to put out the fire. CARMICHAEL: Mr Abbott acknowledges that the Thai government might disagree with his report's findings, since it is based solely on Cambodian accounts. ABBOTT: I am absolutely sure as you suggest that Thailand will dispute this account. We've been interviewing Cambodian villagers, and that's why a neutral organization like ASEAN needs to investigate this and get the Thai side of events. CARMICHAEL: It isn't clear what Thailand thinks of all this since the spokesperson from the Thai embassy in Phnom Penh was unavailable for comment. But as far as the Cambodian government is concerned, says information minister Khieu Kanharith, the market had no military value - he believes the shelling was deliberate and a gross violation of international law. But he says bilateral talks are a better way to solve the issue than involving ASEAN. As for compensation, Khieu Kanharith says Phnom Penh is in favour of Thailand making payments to the villagers. And although he hasn't heard anything yet from Bangkok, he expects some gesture will be forthcoming. In the meantime, and with the rainy season fast approaching, Phnom Penh has provided housing materials for the 900 affected people allowing them to rebuild their homes at a new site 20 kilometres away. The government will also rebuild the market. Observers have pointed out that the situation around the Preah Vihear temple often worsens when Thai political tensions rise - and Thai politics are still far from stable. It remains to be seen whether the events of early April mark the low point between Cambodia and Thailand over the border at the 900-year-old temple. THE US embassy in Cambodia is inviting secondary school teachers to apply for a position in its annual Teaching Excellence and Achievement Program (TEA). The program provides 156 secondary school teachers from around the world the opportunity to travel to the United States to develop expertise in their subject areas, enhance their teaching skills, and increase their knowledge about the US. US embassy spokesman John Johnson said they hoped to send four or five Cambodian teachers this year. "I think that Cambodia's education level, quality and ability are improving every year, and this is something we are keen to support," he said. The program is open to secondary-level, full-time teachers with five or more years of classroom experience in either English as a foreign language, social sciences, mathematics or science. Applications close on May 22. Last year, 40 teachers from Cambodia applied and three were selected for a two-month stint in the US. According to the Ministry of Education, Youth and Sports, there are currently 103,618 teachers in Cambodia. Soeur Socheata, deputy general director of administration and finance at the education ministry, said he hoped the program would encourage a healthy spirit of competition among teachers, especially those from rural areas. It encourages teachers to test their abilities both in Cambodia and internationally. "This program is good because it encourages teachers to test their abilities both in Cambodia and internationally," he said. The program will include coursework and intensive training in teaching methodologies, lesson planning and teaching strategies for the participants' home environment. It will also train participants in the use of computers for internet research, word processing and as teaching tools. participants to American teachers and students. Trips to US cultural sites and academic support will be provided for participants throughout the program. The program is financed by the Bureau of Educational and Cultural Affairs of the US Department of State, and implemented by IREX, a Washington, DC-based nonprofit organisation. Mrs Mu Sochua vs. Mr Hun Sen.
Prime Minister Hun Sen has strongly blasted Mrs. Mu Sochua and warned that he is ready to strip her parliamentary immunity, as both sides in the legal battle have formally lodged their lawsuit and counter-suit against each other, reports Deum Ampil newspaper. 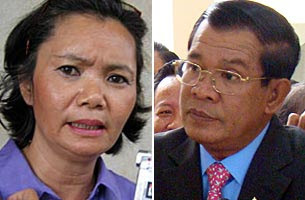 In a public speech a few days ago, Mr. Hun Sen said: "She is a fool herself but accused others of insulting other women. And I am ready to allow the parliament to strip my parliamentary immunity when the court issues an order to the Ministry of Justice and pass it on to parliament to strip my parliamentary immunity. But to strip my parliamentary immunity, it needs 2/3 majority." Mr. Hun Sen added: "I did not counter-sue, I was pre-emptively suing (her) for defamation which she had made during her press conference last Thursday which I have sufficient evidence, including audio tapes and photos." Mr. Hun Sen was not only suing Mrs. Mu Sochua, but he is suing her lawyer, Mr. Kong Sam Onn, as well. He is demanding 1o million Riels (~$2500) in compensation. He said that the money will be given to the orphanages, says Deum Ampil. Australian government, through AusAid, granted $3 million to Cambodian National Radio to implement its administration in the rural areas. Mr. Khieu Kanharith, Minister of Information and Mrs. Margaret Adamson, (pictured) Australian Ambassador to Cambodia, signed a Memorandum of Understanding on 27th April at the Ministry of Information. Mrs. Adamson said the Australian government is happy to provide support to the Ministry of Information so that it could strengthen the broadcast capacity of the Cambodian National Radio so that it could broadcast news on time. Mr. Kanharith said he hopes the Memorandum of Understanding will help pave the way for Australian assistance in the strengthening of editorial and technical capacity that will make Cambodian National Radio become a leading broadcaster in the nation in providing quality, unbiased and updated news to the general public. Defence Minister Tea Banh, in an exclusive interview with Bangkok Post military reporter Wassana Nanuam, denied any contact between Cambodia and Thaksin. "I have never seen Thaksin come here to Cambodia," he told the reporter. "Why should he have to come here? What's the use of coming here? We cannot do anything to help him now. He might want to go somewhere else, but not Cambodia." Thaksin Shinawatra's private plane travelled to Cambodia twice after the convicted former prime minister skipped bail, according to information leaked from the Royal Thai Air Force. A source said RTAF chief Itthaporn Subhawong ordered the air force's radar centre to monitor movements along the Cambodia border. The centre confirmed that Thaksin's private jet was seen flying to Cambodia on two occasions. The jet landed in Phnom Penh and Koh Kong, the source said. 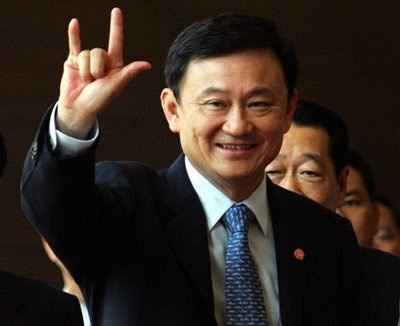 Thaksin (pictured) is currently in exile abroad after leaving the country while on bail awaiting trial on charges of abuse of power over the Ratchadaphisek land deal during his term in office. He was sentenced in absentia to two years in jail. Cambodian Defence Minister Tea Banh yesterday said Cambodia had not issued Thaksin with a passport. Speaking at the 6th meeting of the Thai-Cambodia General Border Committee (GBC) in Siem Reap, Gen Tea Banh said Thaksin had not sought refuge or gone into hiding in Cambodia. He was at one stage rumoured to be in Phnom Penh and Koh Kong, from where he conducted his phone-in addresses to red shirt supporters in Thailand. Prime Minister Hun Sen was unhappy about the rumours, said Gen Tea Banh, who condemned the hearsay for causing mistrust between the two countries. He said the Cambodian government had investigated rumours of Thaksin being in Cambodia and found them to be groundless. "Why should Mr Thaksin have to come here to Cambodia? He will not get anything here and we can't help him any longer," the minister said. Gen Tea Banh said Cambodia did not want to get involved in Thai politics. It just wanted Thailand to restore peace and reconciliation so the two countries could work together to solve their border disputes. 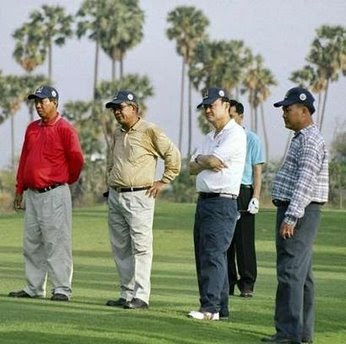 Tea Banh (L) used to play golf with Thaksin (second R) when the latter was Thai PM. Second left is Hun Sen.
Cambodian Defence Minister Tea Banh talked to defence reporter Wassana Nanuam at the 6th meeting of the General Border Committee, denying rumours that former prime minister Thaksin Shinawatra had sneaked into Cambodia after fleeing into self-imposed exile overseas. Wassana Nanuam: Is it true that the Cambodian government issued a passport to Mr Thaksin? Tea Banh: No. that's not true. I have never heard that. What about reports that Mr Thaksin flew in his private jet to both Phnom Penh and Koh Kong? WN: I have never seen Thaksin come here to Cambodia. Why should he have to come here? What's the use of coming here? TB: We cannot do anything to help him now. He might want to go somewhere else, but not Cambodia. WN: Thai intelligence agencies had reports that Mr Thaksin flew to Phnom Penh and stayed at the residence of Prime Minister Hun Sen.
TB: No. They were rumours. How could that have happened? Mr Hun Sen himself was unhappy with this. They were purely rumours. We don't want to meddle in Thai politics. We want to see Thai people love each other and live in harmony and then we will be able to work together to solve the existing [border] disputes. WN: What do you think about these rumours? TB: I don't think spreading such rumours is constructive. They could cause mistrust and strain relations between the two countries. We want to forge better ties and work together to develop the economy. WN: Political problems in Thailand have also stalled joint efforts to settle the border disputes. What is the relationship between Mr Thaksin and the Cambodian leader? TB: They were just acquaintances. Cambodia does not want to meddle in Thailand's internal affairs. WN: Could Cambodia help monitor the movements of Mr Thaksin? TB: I can confirm that Thaksin has never been to Cambodia [since he fled into self-imposed exile]. If he was here, I would have to be aware of that. Cambodian Defence Minister Tea Banh has reportedly dismissed allegations that Thaksin Shinawatra had entered Cambodia and that he had been given a Cambodian passport. Tea Banh (pictured) insisted that Thaksin had never set foot in Cambodia as reported by the media, adding that it was not in his government's interest to back the fugitive leader. If Jakrapob fails to report to the prosecutors on June 15, his guarantors would be asked to find him or an arrest warrant would be issued for him, Kayasit told a press conference at the Attorney-General's Office. Duch's photo taken in 1977. Phnom Penh - An international monitor at Cambodia's UN-backed Khmer Rouge tribunal warned Wednesday that the first trial before the cash-strapped court could run much longer than scheduled because of delays in proceedings. In its weekly report on the progress of the trial of former torture prison chief Kaing Guek Eav, known by his revolutionary alias Duch, the US-based War Crimes Studies Center said the trial had been weighed down by procedural arguments and only a handful of witnesses had been called to testify. "The initial estimates of the trial completing in 12 weeks now seem somewhat unrealistic," the report said. "Given the chamber is yet to hear an estimated 49 further witnesses, proceedings may continue till at least the end of 2009." The long-awaited trial began in March, and Duch faces charges of crimes against humanity, torture, premeditated murder and breeches of the Geneva conventions, allegedly committed while he was the warden of the S-21 torture prison during the Khmer Rouge's 1975-1979 rule. At least 15,000 men, women and children were imprisoned, interrogated and tortured at the school-turned-prison in Phnom Penh's suburbs before being murdered at the Choeung Ek "killing fields" on the outskirts of the capital. 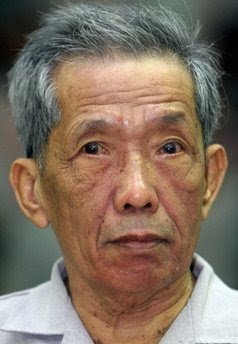 In his opening address at the trial in March, the 66-year-old former mathematics teacher apologized to S-21 victims, their families and the country but asserted that he was merely following the orders of his superiors. The trial was scheduled to conclude on July 2, but judges made a provision in the schedule to extend the hearing if necessary. Tribunal spokeswoman Helen Jarvis said she had not read the War Crimes Studies Center report but said judges would release a revised schedule for the trial at the end of the week. "It is hard to project from the first few weeks how long these things will run, but we are hopeful that the trial will follow the schedule closely," she said. According to the War Crimes Studies Center, which is based at the University of California at Berkeley, translation errors were also hindering the court's progress. The court's three official languages are English, French and Khmer. "Trial proceedings were significantly hindered by the questionable quality of translation this week with international defence counsel Francois Roux raising this as a serious violation of the accused person's right to a fair trial," the report said. The centre said Roux complained that about 50 per cent of what was being said during last week's proceedings was misinterpreted while Cambodian monitors estimated that about 30 to 40 per cent was misinterpreted. "It seemed clear this week that the KRT is experiencing problems with translation of a magnitude significantly greater and more troubling than previously experienced by other international justice institutions," the report said. "At points, it was impossible for non-Khmer speakers to understand the meaning of exchanges between the judges and the accused person." Spokeswoman Helen Jarvis said the court was "working to overcome" translation difficulties and suggested the relative inexperience of the tribunal's Khmer-language interpreters was a factor in the problems. "Lest we forget that a generation of educated people was wiped out during the Khmer Rouge era, so Cambodia is still recovering from that, and the level of education makes translation resources scarce," she said. "We have a young translation team, and they are doing a very good job." Duch is one of five former Khmer Rouge leaders facing trial for their alleged roles in the deaths of up to 2 million people through execution, starvation or overwork during the Maoist group's rule. The tribunal was established in 2006 after a decade of negotiations between the United Nations and the Cambodian government and consists of international and domestic judges, prosecutors and defence lawyers. The United Nations froze funding for the Cambodian side of the court in July after allegations that domestic staff members were being forced to pay kickbacks to their superiors. The UN said the funds would remain frozen until the Cambodian government conducted a full investigation into the allegations. The court's top Cambodian judge said in February that funds for the domestic side had dried up, and staff members were forced to work without salaries until Japan provided emergency funding for April. As municipal election is nearing, the ruling Cambodian People's Party has increased pressures on councilors from the opposition parties to vote for them, including attempting to buy their votes. Mu Sochua (L) and Hun Sen (R). Details of Hun Sen's countersuit emerge. AS the pretrial exchange of barbs between Sam Rainsy Party lawmaker Mu Sochua and Prime Minister Hun Sen escalates, the details of Hun Sen's countersuit for defamation have emerged. Responding to a lawsuit lodged by the SRP parliamentarian for Kampot, Mu Sochua, government lawyer Ky Tech, representing Hun Sen, filed a countersuit. Ky Tech claims he might seek as much as 10 million riels (US$2,427) in damages from Mu Sochua and other, unspecified involved persons for the defamation of his client in the press conference last Thursday. Ky Tech said he was confident, "as his attorney, if I thought I wasn't going to win this case, I would not file a complaint". Mu Sochua said Tuesday that as long as the court remained independent, and the judging neutral and fair, she would win her case. Mu Sochua is seeking only a symbolic 500 riels as compensation for Hun Sen's comments of April 4. She pointed out that because this case involves a head of government, the government must refrain from pressuring the courts. Asserting she was willing to face suspension of her parliamentary immunity for the case, she said "I would like the court to ... follow the law. [Hun Sen] always said whoever has high rank must be equal in the face of the law." Executive director of the Centre for Social Development, Theary Seng, said that the case should not even reach the court as "politicians take the court as the tool and it renders the court worthless. They should resolve their case out of the court". Former prison chief addresses killings of regime officials under his command as trial continues to explore S-21. Duch speaks in court in this photograph of a television set broadcasting the proceedings at the ECCC earlier in the trial. FORMER Khmer Rouge prison chief Kaing Guek Eav told the UN-backed war crimes court Tuesday he knew the actions of the regime were "unjust" when it began turning on its own people, referring to the purification of Khmer Rouge cadres inside the S-21 security centre as "evil eating evil". "The work [of S-21] expanded, people were arrested illegally, right or wrong.... S-21 smashed members of the party including permanent committee members.... I consider it evil eating evil," the former cadre, known as Duch, said. On day 13 of his trial, the former jailer continued to flit between regretting his alleged crimes and defending them, saying that he was not only an "instrument" of the regime, but like a "Berger [dog], very loyal to the superiors". "Since I became chief of S-21, I received orders to purify the internal cadres of the party," he said. "We could not protest against the decision ... If we protested, we would have been sentenced," Duch added. Duch told the court on Tuesday that he was trained by his superior Son Sen, as well as Vorn Vet, Lon Nol and the colonial French police, to interrogate prisoners. In response to questions from co-prosecutors, he admitted to also reading books about interrogation techniques, including former CIA director Allen Dulles's The Craft of Intelligence and others by the KGB. But he told the court that he had not read the books in full because of language difficulties. "I only read some of the pages ... after, I sent them to Son Sen because of time and language difficulties," Duch said. Regarding the Tuol Sleng prison, which was part of the wider S-21 security complex, he said that he now believed the transformation of a school into a torture centre was a "mistreatment of the culture and civilisation of humanity". LONG BEACH - One sign came when she couldn't enter the existing library because the floor was covered with six inches of rice that had been put there to dry during harvest season. Another was the selection of volumes, such as the organic chemistry textbooks, in English, that a well-meaning but obviously clueless charity donated to the rural school in the poor farming community. Still another was the abundance of books in French and English, but the paucity of books in Khmer. So, Peace Corps volunteer Emi Caitlin Ishigooka from Long Beach jumped at the opportunity to create a new library when approached with the idea by the director of the Cambodian school where she was teaching high school English. A 26-year-old UCLA and Poly High graduate who will attend USC graduate school in public administration in the fall, Ishigooka recently returned from a two-year stint as one of the inaugural group of Peace Corps volunteers assigned to Cambodia. While she has come back to the U.S. with the usual bucketful of stories about life in a village with no running water, strange encounters with the local fauna and edible delicacies such as fried tarantulas, it is the library she built in her second year abroad that has the most meaning. In the truest of the people, by the people and for the people tradition, Ishigooka says that from the outset she wanted the students to be the driving force. a major say," Ishigooka said. "They gave me the titles and subjects that interested them. I did keep one Norton Anthology, though." Ishigooka applied for a grant from the Peace Corps, eventually raising about $3,500, including $300 or $400 from the students and the families themselves. Once a new non-produce storing building was found, students began cleaning and decorating the new facility, including painting a large mural of the world on the wall. money, we were able to get books for all grade levels," Ishigooka said. And they were able to get them in Khmer: novels, history, poetry, even an edition in translation of Harry Potter. The library was also outfitted with a listening center to help students with languages and other learning areas. For Ishigooka, as important as getting the actual volumes, was giving the students a sense of ownership and responsibility for the library. This included students volunteering to staff the library, setting schedules and actually be there during operating hours, along with maintaining the facility. "This was built by an incredible group," Ishigooka says. The best part, was "to see students make it their own. Now the student librarians are leaders and role models. And in the process we were promoting volunteerism, which for a Peace Corps volunteer is pretty phenomenal." As she sits at a Starbucks near the Traffic Circle and begins to renew her relationship with coffee, finds a job, visits with friends, checks text messages, prepares for graduate school and negotiates with her mom for use of the car, the 26-year-old is very much back into the hectic flow of life of an young American woman on the upward career and educational track. But a part of Ishigooka will always be in Cambodia, beyond the retainer a rat absconded with. When Ishigooka looks back, she hopes she left something lasting and tangible. "The kids are are so proud and took such good care of (the library) that I'm confident years from now it will still be there and be a big part of the school and community," Ishigooka says. PHNOM PENH (AFP) — The former Khmer Rouge prison chief has denied he waterboarded or suffocated detainees as he detailed his torture techniques to Cambodia's UN-backed war crimes trial. 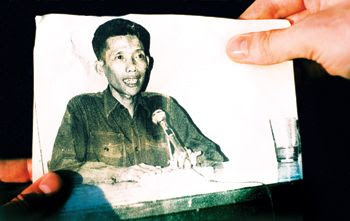 Duch -- whose real name is Kaing Guek Eav -- apologised at the start of his trial last month for the torture and extermination of 15,000 people who passed through the regime's Tuol Sleng prison, also known as S-21. But he said he had not used the simulated drowning technique called waterboarding, and had not put plastic bags over prisoners' heads because of the danger they could suffocate to death. "The kind of waterboarding technique was not employed and the plastic bag was also not a kind of technique," Duch said. Duch said he discussed interrogation tactics with Khmer Rouge cadres soon after he began working at the prison. "There were two techniques. The normal beating technique and the electrocution technique with use of a telephone (line)... which was connected to an electric current to electrocute prisoners. That was true," Duch said. The United States has been heavily criticised for using waterboarding to interrogate suspected Al-Qaeda prisoners, with many commentators citing it as a brutal method of the Khmer Rouge. Duch is charged with crimes against humanity, war crimes, torture and premeditated murder over the extermination of thousands of people between 1975 and 1979 at Tuol Sleng and the nearby "Killing Fields." However, he has denied prosecutors' claims that he played a central role in the Khmer Rouge's iron-fisted rule, and maintains he never personally executed anyone. He faces life in jail but the court does not have the power to impose the death penalty. Four other senior leaders from the regime are scheduled to be tried within the next year. Many believe the UN-sponsored tribunal is the last chance to find justice for victims of the regime, which killed up to two million people through starvation, overwork, torture and execution. The Khmer Rouge were ousted in 1979 by Hanoi-backed forces who discovered Tuol Sleng and established the facility as a museum to display the regime's crimes. FISH exports are expected to rise this year on the back of an increase in domestic fish farm production, according to fisheries officials and exporters. Nao Thuok, director of the Fisheries Administration at the Ministry of Agriculture, Forestry and Fisheries, said that officials expected that 50,000 tonnes of farmed fish would be harvested in 2009 from the Kingdom's 300,000 fish ponds, boosting regional exports. "We are aiming to export more of our fisheries produce abroad to earn more income and boost the national economy," he said Tuesday. Dwindling global fish stocks are leading importers to look to countries like Cambodia where limited technology has left resources largely untapped. The Cambodian government is working to promote local fish exports, but lack of quality standards has prevented local farmers and fishermen from making significant inroads into Western markets. We will encourage more aquaculture production in the country. "We will encourage more aquacultural production in the country to increase fish production for future export," he said. Cambodia harvested 365,000 tonnes of freshwater fish, 66,000 tonnes of marine fish, and 40,000 tonnes of farmed fish in 2008, according to ministry statistics. A total of 25,000 tonnes of fish were exported to Australia, Vietnam, Thailand, China, Malaysia, Singapore and Hong Kong last year. Fish exporters also say increases in local production - especially from farms - would contribute to an increase in exports in 2009. "This year, we are receiving only about US$6 or $7 per kilogram, which is about half of the price we got last year," said Chhay Heang, president of the Chhay Heang Group, which exports to China, Hong Kong, Malaysia and Singapore. He said that low production costs would allow Cambodia to sell fish at cheaper prices while still earning a profit. "I expect to see a 20-tonne increase in the company's exports," he said. Vuth Chanthou, managing director of Chanthou Meanchey Company, which exports between 100 and 1,000 tonnes per year to Thailand and Vietnam, said that an increase in fisheries production would prompt more exports. "We will be able to export more fish than last year because we can buy more fish locally," he said. According to World Bank figures, fish production accounted for 7 percent of the Kingdom's GDP in 2007, with freshwater fish going mostly to the local market and saltwater fish for export. Cambodia earns about $100 million per year from fish exports, but low sanitary standards have held back growth in Western markets, and Cambodian fish are currently banned from the European Union and the United States. The World Bank said that Cambodia has strong potential as an exporter of both fish and fish feed. Its most recent report said that Cambodia has the potential to raise between 500,000 and 1 million tonnes of catfish and tilapia per year, both of which are components of fish feed.